In addition to describing and naming thousands of new species the German biologist and philosopher Ernst Haeckel was behind some of history’s most impressive meetings of science and art. Dr Mario A. Di Gregorio explores Haeckel’s unique idea of “monism” which lies behind the mesmerising illustrations of his most famous work, Kunstformen Der Natur. Few people were better known in the nineteenth century than the German zoologist and Darwinist Ernst Haeckel (1834-1919), yet nowadays he is known to many simply as the man who coined the phrase “ontogeny recapitulates phylogey” – the Biogenetic Law. There is much more to Haeckel than this. Haeckel studied medicine at Würzburg with Rudolf Virchow, who taught him the importance of cell theory, and at Berlin with Johannes Müller, who remained his inspiration and ideal of a teacher. His main cultural influences were Alexander von Humboldt, and, like all educated Germans, J.W. Goethe. Haeckel never wanted to be a physician but aimed for a synthesis of his interest in zoology with his artistic ability and sensibility. The decisive event for his career was the patronage and friendship he received from the anatomist and morphologist Carl Gegenbaur. This led to an appointment at the university of Jena, where he stayed all his life, and a scientific journey to southern Italy where he studied marine invertebrate zoology, in particluar radiolarians, which first suggested to him a close connection between the scientific study of nature and its inner beauty. 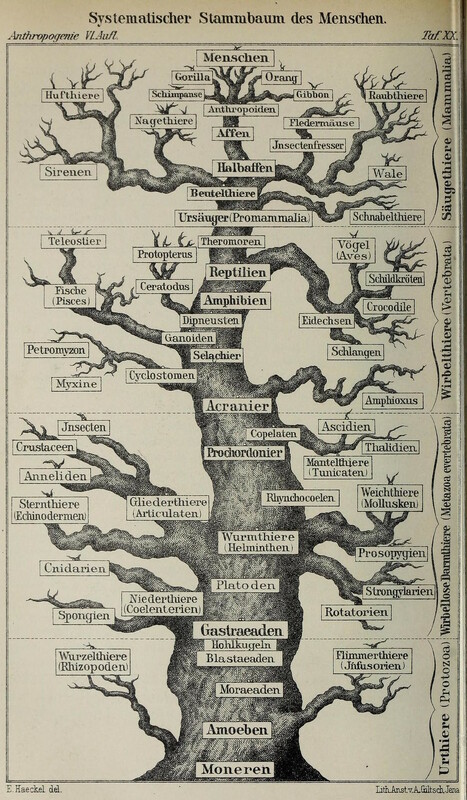 On his return to Jena in 1860, Haeckel read the German translation of Charles Darwin’s Origin of Species. He was thoroughly won over by the book to the extent that he became the most outspoken supporter and propagandist of an evolutionary view, one which combined Lamarckian and Darwinian elements with the morphological interpretation of the aesthetic aspects of nature – thus fulfilling Goethe’s and Humboldt’s ideal of the unity of culture. Photograph of Haeckel by Nicola Perscheid, published in Photographische Gesellschaft in 1906, two years after Kunstformen Der Natur — Source. In 1866, Haeckel published his major theoretical work, Die Generelle Morphologie der Organismen (The General Morphology of Organisms). It was, however, a difficult book and seldom read. In response he went on to publish his lectures on evolution in Natuerliche Schpfungsgeschichte (The History of Creation) which, on the other hand, in its many editions from 1868 onwards, was a great success. Haeckel’s view of evolution can be summarized as follows: at no point did God create anything, whether inorganic or organic. All is originated through an incessant progressive process leading from the simplest to the most complex – organic matter originating from inorganic matter through spontaneous generation – a process called Entwicklungsgeschichte, the “history of development”. In this process lower living forms start from a simple cell and follow a long evolutionary path leading to higher forms. The process of life, in its increasing intricacy, can be represented best in the branching forms of the tree and Haeckel, an excellent artist, drew many beautiful such trees. In them we find explained what he believes to be the fundamental law of natural evolution, the Biogenetic Law, that is “Ontogeny recapitulates phylogeny”. Every living form travels in its embryological development (ontogeny) through stages which resemble — recapitulate, in fact — the stages through which the group to which that animal belongs itself went through in the course of its evolution (phylogeny). The gaps in the geological record of evolutionary process can be filled by hypothetical passages, and thus embryology and its foundation, cell theory, solves the evolutionary problems left unsolved by paleontology. The highest forms are nothing but lower forms which in their history have grown to their higher position in the tree of life – a new version of Lamarck’s transformism. A worm follows an evolutionary path which takes it to higher and higher forms – man being of course the highest in its most elevated aspect, educated man. Indeed, we may conclude that a German professor is nothing but a progressed worm. Natural selection is seen by Haeckel as applicable not so much to individuals but mainly to groups, the Phyla – a word introduced by Haeckel himself (one of the many new words he invented, although only a few, such as “ecology”, have survived). Hackels’s “phylogenetic tree of life” — Source. This scheme can be applied to any part of the living world, whether fungi, plant, animal or, by consequence, to the highest pinnacle of evolution, man. In Haeckel’s thought, man is basically an evolved ape and, looking further back, an evolved worm. The main character which distinguishes man from apes is language and to fill the gaps between speechless apes and speaking man Haeckel hypothesized a link which he called “Pithecanthropus alalus”, that is “speechless apeman”. He had been interested in languages since the days of his friendship with Jena philologist August Schleicher, supporter of an evolutionary interpretation of languages, and was aware of the studies performed by his cousin Wilhelm Bleek in South Africa on the language spoken by the Bushmen which Bleek suggested represented the nearest approximation to the original language of humankind. Haeckel used Bleek’s studies to claim that there was a hierarchy of languages corresponding to the hierarchy of races which spoke them. He claimed that this hierarchy of languages showed that the “lower” human races were closer to apes than to the “higher” races – the highest being the educated man descended from the ancient Greeks. Culture was for Haeckel a much stronger method of studying humans than the physical anthropology propounded by his former teacher Virchow. A vital aspect of Haeckel’s programme of a “unity of culture” was his attempt to provide a bridge between biological science and art, the result of which was the visually dazzling Kunstformen der Natur, the Art Forms of Nature, published in 1904. With the assistance of Jena artist-lithographer Adolf Giltsch, Haeckel produced one hundred plates depicting the forms of animal life, mainly marine animals. With this book Haeckel wanted to create an “aesthetics of nature” and to show how the incessant struggle for existence he had learnt from Darwin was in fact producing an endless beauty and variety of forms – Darwin and Humboldt combined together. In all his works Haeckel focused on the aspects of knowledge that pointed to a general unitarian outlook, a unity he believed to underlie the superficial diversity of all things. Haeckel called his view of unity “monism”, a term coined in juxtaposition to dualist conceptions, which postulated gaps or oppositions in the explanation of reality in all its aspects. His hostility to dualism was such that over time he would come to label anything he disliked as dualist. In perfect Orwellian fashion, he held the motto “monist good – dualist bad” as his main guiding mantra. This monism became a real philosophy, a theology and an ideology. In it there was no room for the traditional Christian God, which science, Haeckel said with dubious humour, had reduced to a mere “gaseous vertebrate”. Rather than an atheism, however, Haeckel saw a unity of God and nature in a conception reminiscent of Spinoza’s Pantheism. Following his main theological influence, David Friedrich Strauss, Haeckel believed that science had killed the traditional concept of God and replaced it with the forces of nature which were best made sense of by the modern theory of evolution. Thus evolution – Darwinism combined with Lamarck – was the foundation that made possible the modern worldview. No dualism, no divine creation, no afterlife, just the eternal existence of force and matter in incessant change. Individuals were the ephemeral means for the maintenance of force and matter, and into the eternal substance of the universe from which they had come they would return: from here to eternity. Monism became a true movement and the Monist League became a major reference for the educated free-thinkers around the turn of the century, Haeckel being openly advocated as the “anti-pope”. The very beginning of the twentieth century saw the publication of Die Welträtsel (The Riddle of the Universe), which served to summarise and expound all his main views. The book was widely read and translated into many languages. It made Haeckel possibly the most famous scientist of the time. It was the triumph of progress and monism, the light for the new path that mankind had to follow in order to build a brave new world. But a tragic event seemed to destroy that plan – the First World War. Haeckel was devastated, blaming it all on British greed. When the war was over, however, he did regain some of his optimism, not realizing though that with the war his dream of progress through evolution and the final marriage of scientific and artistic truth was smashed, and with it too the fame of Professor Ernst Haeckel. An examination of the origin, sources, structure, significance and consequences of the theory of the German biologist, philosopher, and artist Ernst Haeckel.